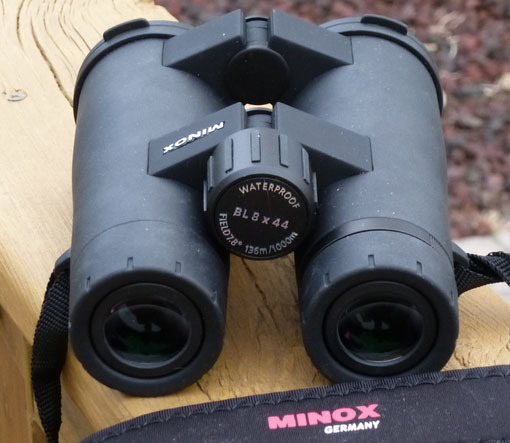 The Minox BL 8x44mm binocular offers a 406 foot field of view at 1000 yards, along with a weight of about 26 ounces. This is an upscale, yet affordable binocular that runs a bit under five hundred dollars, either in this 8x44mm configuration or the similar 10x44mm offering. Binoculars don't seem to get much love. Often the fellow with a five hundred dollar scope on his hunting rifle may ignore even one quality set of binoculars that works well for hunting, general scouting, nature-loving, hiking, fishing, astronomy and so forth. Binocular configuration is a personal choice and invariably a compromise. The heaviest part of most optics is the glass itself. So, while we all want light and compact, it doesn't happen without smaller lenses and a reduction in exit pupil diameter and image quality. Personally, I've always found the dinky binocular approach to be a headache, literally. The 8x32 platform is where binoculars become useable, to my eyes, and this 8x44 Minox offers superb image quality while still not being a pain to lug around. The 8x44's are easier to hold steady when out in the field, while the 10x44's give you a larger, but shakier, image at the expense of exit pupil and field of view. I find the 8x magnification ideal for general purpose use, but that is contingent on your intended use. It really doesn't matter what binoculars cost if they give you a shaky image, or you can't focus them, or they don't feel good in your hands. You won't have them with you when you need them if they are burdensome to carry around. Image quality is crucial to enjoying any binocular, but it must be perceptible to the human eye or it is not worth paying for. You are buying optics for human use, specifically your use. Today, we expect certain things in a quality roof-prism binocular: fully multi-coated lenses, phase-corrected prisms, color fidelity, waterproof / dustproof / fogproof design, etc. Any number of binoculars promise “unrivaled brightness, edge-to-edge clarity, amazing color resolution and contrast.” It is hard to find something that doesn't promise to amaze. Actually, I've been amazed so often lately I'd like to take a break from it. There are huge differences in handling and build quality and that is where this Minox binocular shines. The open chassis and slightly tapered barrel design makes one hand operation easy and two hand operation a lead pipe cinch. Where some binoculars have “instant collapse” eye cups, or all or nothing positions, the Minox has four distinct, steady positions for the eye relief you need. Some binoculars have a rusty hinge folding / unfolding feel. These are both rock steady and smooth. The focus knob shows no excessive creep or play, so quick and precise focusing is fast and easy. Some binos have diopter adjustment rings that easily move out of adjustment. The diopter focus is flush on the right barrel of the Minox BL set, so once you focus your binocular to your eye, you won't have to refocus them. Not surprisingly, I do have several 8x42mm binoculars, some above the Minox BL's price point and some below. Thus, I was able to do a (subjective) side-by-side comparison. One complaint with the Minox is the small strap eyelets. They work fine with the supplied Minox strap, but the German made Vero Vellini strap that I wanted to use was too wide to attach. One roof prism set, while optically comparable, had the “all or nothing” collapse syndrome on its eyecups, where the Minox stays in one of four positions. The objective caps seem to be a universal problem, twisting and inadvertently falling open. The Minox attempt is far better than most, but not perfect. Another, pricier ED binocular had slightly better image quality, ever so slightly, but it suffered from the easily knocked around diopter ring problem, while the Minox flush version is clearly superior. The Minox is shorter and more compact, as well. The $500 roof prism price bracket is, as far as I'm concerned, the sweet spot where you can get virtually all of the real-world performance useable by human eyes, if you buy carefully. The salient differences in actual use are in handling, eyecup design and diopter focusing. This is where the Minox shines brightly, along with its smooth operation and overall build quality. There are a couple of niggles: the small strap eyelets and a case that is on the small side. Yet, the end result is an extremely satisfying binocular that deserves to be on everyone's short list, if not permanently in your gear bag. The BL 8x44 is an impressive offering from Minox.